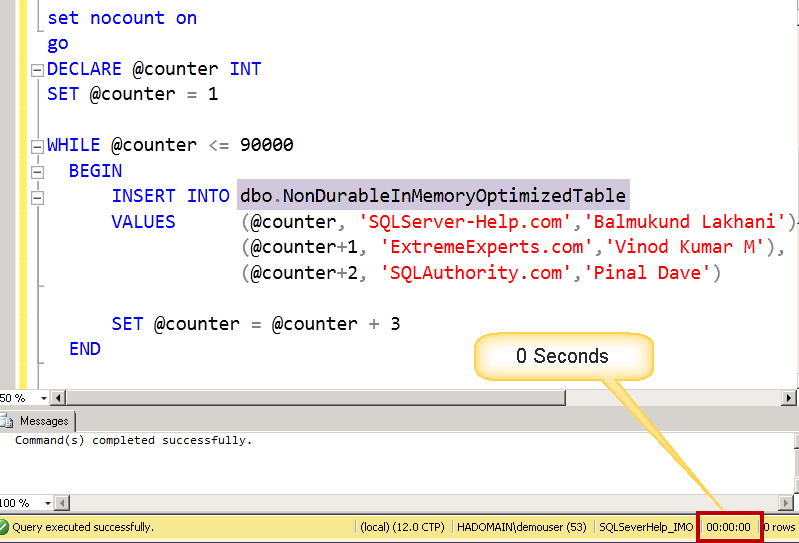 Can you think of a situation where you don’t want to log anything in SQL Server and you are OK even if data is lost? What comes to your mind? Staging tables used in loading phase of Data warehouses? ASP Session state? Temporary logging tables? 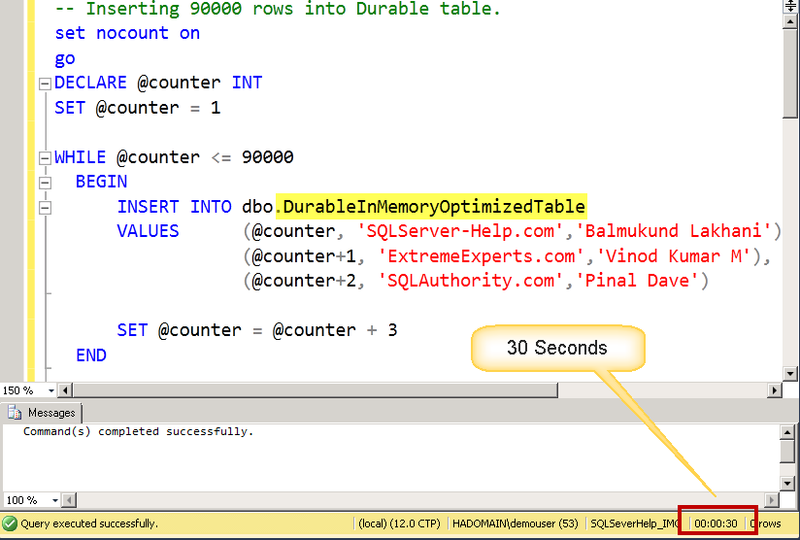 If you have such situations where data is temporary and you are OK to lose the data due to SQL Server restart then you can think of non-durable tables in SQL Server in-memory OLTP. By default, tables are durable. We have briefly discussed here in earlier blog of this series. This is defined by DURABILITY parameter during created table syntax. This indicates whether we want data in the table to be persisted when database is restarted (via offline/online, SQL Service restart or SQL crash). Non durable tables would have SCHEMA_ONLY as the value passed to the durability parameter. Note that these tables are different from the temporary table which we create in tempdb (#table and ##table). One major difference is that tempdb tables are not memory optimized and they won’t be able to survive after restart, including schema. 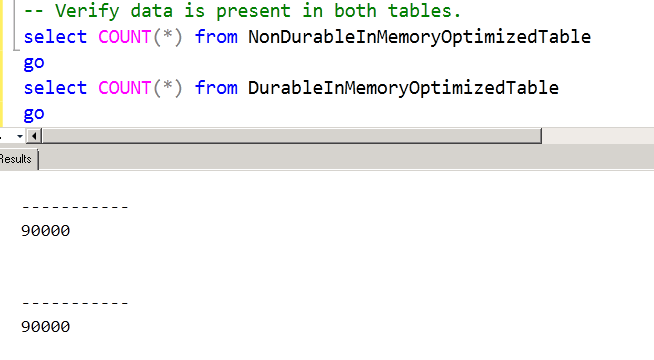 Since both tables are memory optimized, both would have their own DLLs generated. 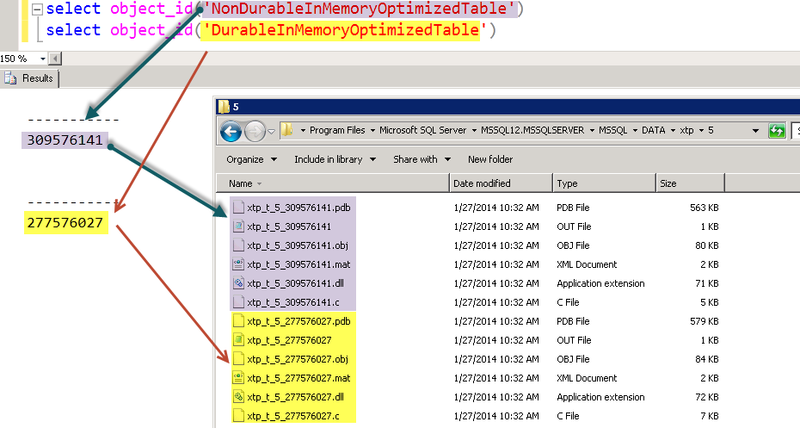 We have discussed DLLs for table in earlier blog here. Let’s load same amount of data in both tables. I have randomly selected 90000 rows (multiple of three – as I have to insert three important names). First I am inserting into Durable table using below script. -- Inserting 90000 rows into Durable table. as we can see it was around 30 seconds on my VM. and now.. non-durable table using below script. How much time do you see in above screen shot? zero ?Trust me, it was almost instantaneous! You don’t trust me? Let count rows from both the tables. -- Verify data is present in both tables. Still don’t trust me? Try yourself! Now, the test of survival! I would take database offline and bring it online. For SCHEMA_ONLY durable table, the data would be cleaned, but schema would remain. Let’s test. -- take database offline and bring online. 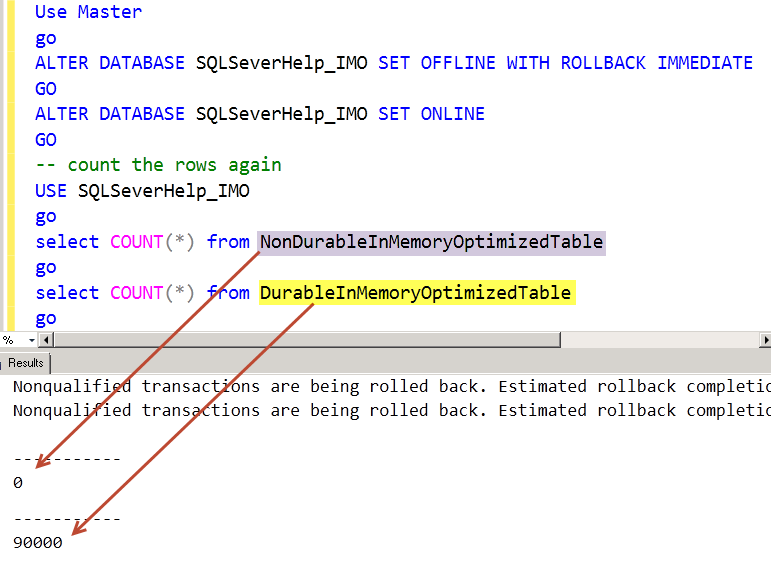 As expected, rows in NonDurableInMemoryOptimizedTable couldn’t survive database restart. To summarize, for non durable table only schema (table definition) would be available after restart/reboot/crash. In other words, it’s a permanent table with temporary data (consistent till restart). Non-durable table are faster in data loading at the cost of data durability. They would be a perfect fit for certain requirements need but useless for others. You MUST evaluate and understand risk of non durable tables before putting them in production. Hope you have learned something new.